This is Love: not that we loved God, but that he loved us and sent his Son…John, The Beloved. According to Paul, Christ (and the gospel) is the mystery of God (Col 2:2; 4:2). The above scripture is one of the 7 mysteries of God, Paul specifically talked about. Mysteries in the New Testament are knowledge of God or Gods eternal purposes/plans that were hidden in His heart throughout the ages (including Old Testament era) but have now been disclosed to His people and requires a persistent seeking on their part to gain more insight/understanding’. During Week 1, Day 3, I briefly talked about why Adam felt alone when he had God as His companion. The pattern or principle God used in creation was He will first create something original and then create a seed or a counterpart according to its own kind. It was like that with the all the plants. sea, land, air creatures (Gen 1). So when God created Adam; God was the Original with Adam being the counterpart. However Adam was placed in a matter (flesh and bones) and therefore, he didn’t seem to be of the same kind to God. Adam might have felt the desire burning within him (the desire for a companion) as he names the creatures realizing they all have companions of their own kind except him. I believe God did this intentionally to arouse the desire in Adam for him to cry out for a companion of his own kind and also to paint a picture of His eternal purpose for man and the earth. God put Adam in a deep sleep and out of his side, He made a companion of his own kind for him. Then God brought her to Adam, and the first word out of his mouth was “WOW! Perfect! Flesh of my flesh and bone of my bone; a companion just like me. I will call her woman (i.e. wo[w]-man)”. 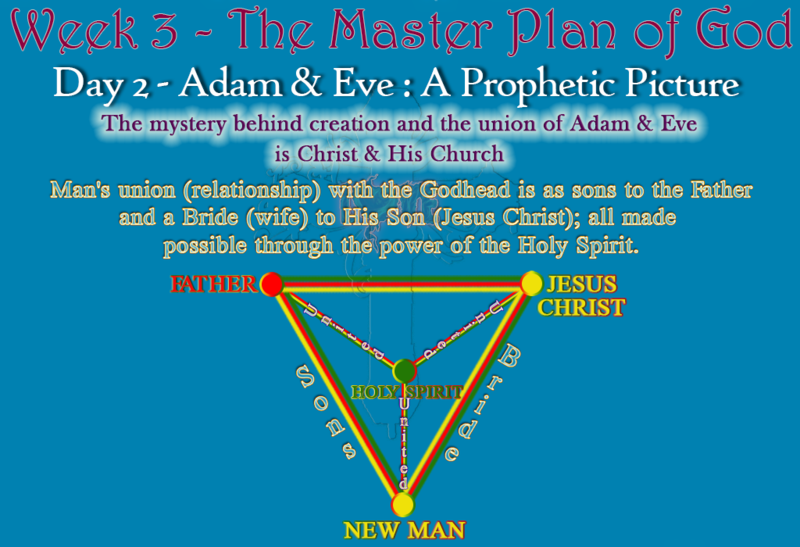 Paul got the revelation of this mystery and said Adam & Eve’s union (i.e. a man & a woman’s marital union) is, in fact, a picture of Christ and the Church. Adam was a type of Christ and Eve as the church. Just as Adam was put into a deep sleep; so was Christ in death (deep sleep). Adam desired for a companion of His own kind; God (Christ) also desire for a people (Church) to be of his own kind (John 17:24). Remember we are shaped into the exact image of the Son. The Son became the “New Man”, Jesus The Christ and He will remain like that forever. This is the eternal master-plan (major part) of God before the world was even created. The Father desiring for a perfect bride fit (holy & Blameless) for His Son. MAN’S UNION (RELATIONSHIP) WITH THE GODHEAD IS AS SONS TO THE FATHER AND A BRIDE (WIFE) TO HIS SON THROUGH THE POWER OF THE HOLY SPIRIT. SIDE NOTE: Have you wondered why when we enter into the life we were actually made for (the next age) the church will not marry or be given into marriage (Luk 20:34-35)? Could it be that since the reality has finally come there will be no need for the shadow (picture) as we see them today in this age?